The car in the water at Wrayton. Picture by Lancs Road Police. A man was rescued from a car which fell into a river after a crash on the A683/A687 at Wrayton. 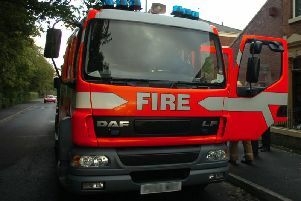 Firefighters were called to Melling Road at around 6.25pm on Sunday night (January 14) to reports of a man trapped in a car in water. Fire crews from Hornby and Lancaster were sent to the scene and upon arrival the man was being treated by ambulance services for minor injuries. Swift Water Rescue from Preston were recovering the vehicle from the water to check if there was anyone in the car. Lancaster Road Policing Team said: “Multi agency rescue resulting in minor injuries only thanks to a quick thinking member of the public. “Could’ve been so much worse! The car in the water at Wrayton. Picture by Liam Hayward and Thomas Beresford. Pictures by Lancaster Road Polic, Thomas Beresford and Liam Hayward.